The Highway Code rules for motorways, including rules for motorway signals, joining the motorway, driving on the motorway, lane discipline, overtaking, stopping and leaving the motorway. Motorway signals (see ‘Light signals controlling traffic’) are used to warn you of a danger ahead. For example, there may be an incident, fog, a spillage or road workers on the carriageway which you may not immediately be able to see. You MUST NOT exceed 70 mph (112 km/h), or the maximum speed limit permitted for your vehicle (see Speed limits table). If a lower speed limit is in force, either permanently or temporarily, at road works for example, youMUST NOT exceed the lower limit. On some motorways, mandatory motorway signals (which display the speed within a red ring) are used to vary the maximum speed limit to improve traffic flow. You MUST NOT exceed this speed limit. You should always drive in the left-hand lane when the road ahead is clear. If you are overtaking a number of slower-moving vehicles, you should return to the left-hand lane as soon as you are safely past. Slow-moving or speed-restricted vehicles should always remain in the left-hand lane of the carriageway unless overtaking. 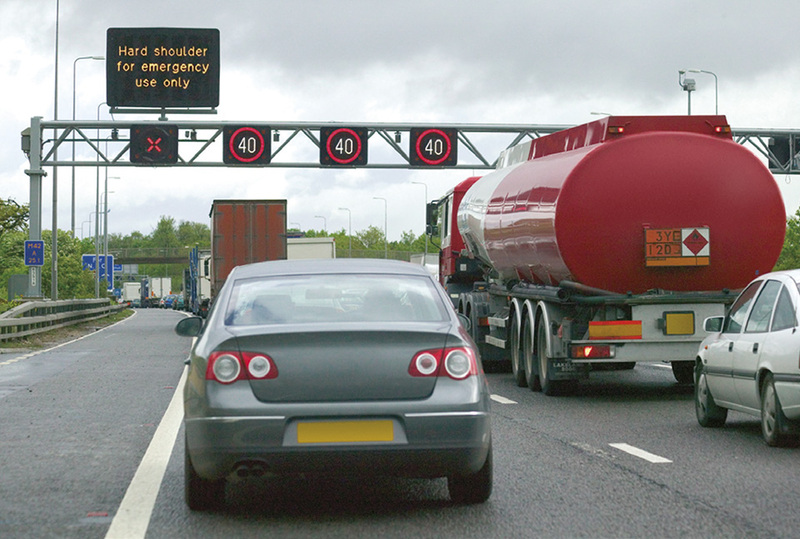 You MUST NOT drive on the hard shoulder except in an emergency or if directed to do so by the police, traffic officers in uniform or by signs. You MUST NOT stop on the carriageway, hard shoulder, slip road, central reservation or verge except in an emergency, or when told to do so by the police, traffic officers in uniform, an emergency sign or by flashing red light signals. Do not stop on the hard shoulder to either make or receive mobile phone calls.